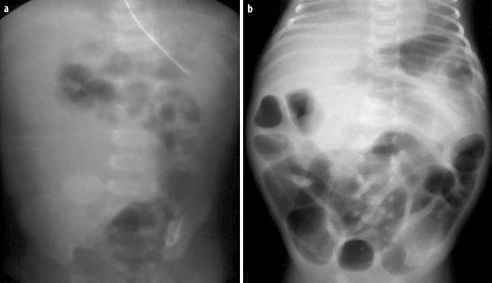 Fatty infiltration of the liver is commonly associated with obesity, diabetes mellitus, Cushing's disease, malnutrition, chronic alcoholic abuse, steroid use or malnutrition related to malignancy or chemotherapy and intravenous hyperalimentation. Differences in perfusion may cause fatty infiltration of the liver to occasionally appear regional or focal and should not be mistaken for mass or infarction. 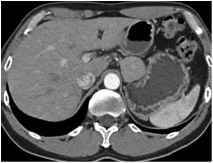 Fatty changes, particularly when patchy, perivascular and multifocal, can be mistaken for liver metastasis on CT scans . However, the presence of an unaltered vascular pattern is a major clue. When focal, in a patient with known malignancy, MRI may occasionally be needed for differentiation from a tumor (Fig. 6). In cases of diffuse fatty infiltration, one or several areas of unaffected liver may remain and represent islands of normal hepatic parenchyma called 'spared areas'. The spleen has various configurations and positions and its position depends on the length of the splenore-nal ligament. Even with normal length, there is some movement to the spleen in supine and prone positions. The length of splenorenal ligament can place the spleen in direct contact with, or even dorsal or caudal to the left kidney. Elongated ligament results in wandering spleen. In addition, accessory spleen and polysplenia should not be misdiagnosed as masses. 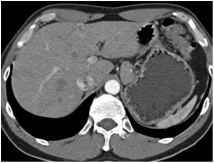 Synchronous and equal enhancement of accessory spleen with the normal spleen is one clue to diagnosis. Patients with history of traumatic splenic rupture who have had a prior splenectomy are prime subjects to develop intra-abdominal splenosis. This condition results in implantation of splenic tissues on the peritoneal surfaces, which grow and mimic small nodules or masses. If the patient develops malignancy at a later age, splenosis should not be mistaken for metastases (Fig. 7). The pancreas is traditionally divided into five parts, the uncinate process, the head, the neck, the body and the tail. The first four parts are retroperitoneal, while the tail extends into the peritoneum ensheathed in the splenorenal ligament and can have variable configurations. The position of the pancreas is often variable and partly attributes to the increasing laxity in the retroperitoneal connective tissue that accompanies the aging process. The position of the tail also depends on the presence and location of the spleen and the left kidney. Normally, the pancreas has homogeneous density and tapers from the head towards the tail, but there are many variations in contour and density. 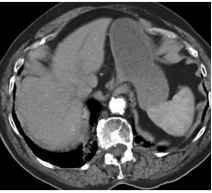 Vascular anomalies and normal variants in the retroperitoneum are often related to the inferior vena cava (IVC) and the left renal vein and may be mistaken for a node on unenhanced CT. These include transposition or duplication of the IVC and circumaortic or retroaortic left renal vein. Fat impingement on IVC can mimic thrombosis. 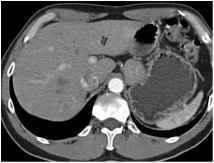 This phenomenon always occurs above the confluence of the hepatic veins and the IVC and relates to the subdi-aphragmatic paraesophageal fat extending laterally and superiorly to impinge on the suprahepatic IVC. Fig. 7. This 47-year-old woman had a splenectomy after a car accident at the age of 17. 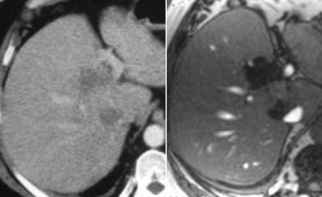 A blood transfusion resulted 30 years later in the development of hepatitis C and eventually hepatocellular carcinoma (seen in the middle CT image). Notice the multiple implants that on nuclear study proved to be splenosis shape (5%) with smooth or concave borders. A gastric di-verticulum arising from the gastric cardia, and extending into the left adrenal fossa can mimic an adrenal mass. Oral contrast and scanning in different positions will often clarify the nature of the apparent mass. Surgery of any type within the abdomen and pelvis may affect the normal orientation of the solid and hollow viscera. This may be due to either organ removal or transplantation, or as a result of an erroneously implanted foreign object, implantation of tissue and prosthesis, or creation of ostomies and pouches. Surgery may be performed in order to remove solid viscera such as a kidney, part of the liver or pelvic organs. As the result of nephrectomy, which may be carried out as a treatment for renal cell carcinoma, unopacified bowel loops, pancreas, gallbladder, or spleen may occupy the vacant renal fossa, mimicking tumor recurrence or simulating an abscess, potentially resulting in unnecessary intervention. Regeneration of the remaining liver by hypertrophy, hy-perplasia, or both starts to take place immediately after partial hepatectomy. On CT, this is recognized by progressive enlargement and change in contour for six months to one year after resection. As a result, the gallbladder is often displaced to an unusual location, mimicking other pathologic conditions. Radical cystectomy results in a vacant space, which is usually filled by intestinal loops. 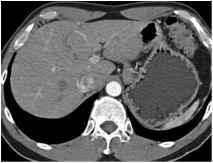 Immediate postopera tive CT may be carried out in order to rule out an abscess, and follow-up CT is often requested to rule out any recurrent neoplasm. The use of adequate oral contrast agent before CT is important in such patients. 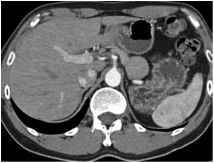 Ileostomy, particularly when identified with opacified urine, is recognizable on CT, however a non-opacified continent ileostomy can be mistaken for an abscess or other collections. Loop electrosurgical excision procedure (LEEP) is a way to test and treat cervical dysplasia. In some cases, it may be used to treat the early stages of cervical cancer. After such a procedure, the CT or ultrasound (US) will show the paucity of cervical tissue as a focal cervical canal dilatation mimicking a cystic lesion (Fig. 8). After APR for rectal carcinoma, in addition to recurrent tumors, the differential diagnosis of a presacral soft tissue mass should include unopacified bowel loops, relocated pelvic organs such as seminal vesicles or uterus, and postoperative fibrosis [8, 9]. Although the recurrent tumor often needs to be proven by biopsy or follow up, recognition of the other conditions is important to prevent an unnecessary intervention (Fig. 9).